A field-tested product with excellent performance and customer satisfaction. Covertan has a full quality guarantee. This company covers approximately 10,000 acres per year! 31’, 36’, 42’, and 50’ .55 oz. crop cover has reinforced edges. Covertan protects against cold temperature, frost, wind, harmful insects, and birds. Ideal for packing out earlier or later-Fall) quality produce. This unique non-woven fabric has remarkable tear resistance and is U.V. stabilized. Allows up to 90% of the light to reach the crops, which provides ideal day and night time cover protection. 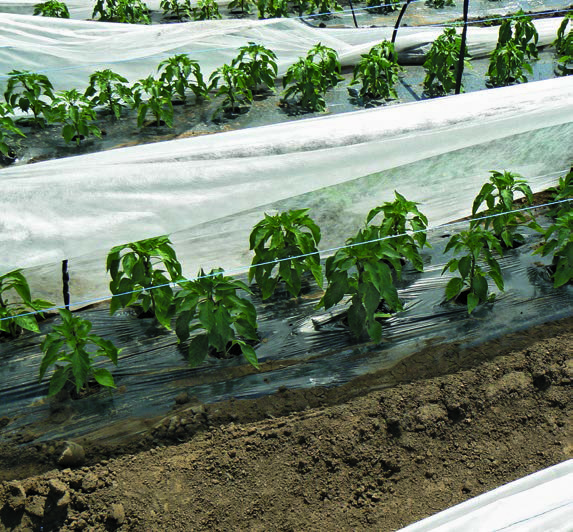 These row covers are lightweight to gently protect young plants without crushing. It also protects against light frost; raises soil and air temperature by several degrees Fahrenheit.